Oh, what joy these Uzbek statistics are! They are optimistic like the president smiling surrounded by happy subjects depicted posters. It is also far from reality as the Akhborot news bulletin, which daily reports on the non-existent grandiose successes. Last but certainly not least, they shamelessly lie like the government-run newspapers. And they, of course, are only pieces in the large propaganda machine, which could perhaps be called the “ministry of truth,” which continuously spits out more and more “proofs” of wellbeing, thriving and the “great future.” However, it turns out that even this seemingly flawless state machine breaks down once in a while… The officials appear to have problems with arithmetic in offering details on the economy. Experts on Uzbekistan were taken aback when a webpage with the official date on the economy for 2012 became inaccessible on the website of the State Committee for Statistics of Uzbekistan. A voluminous report was only available for a few days after it was published on 19 February 2013, and was later irreversible removed. 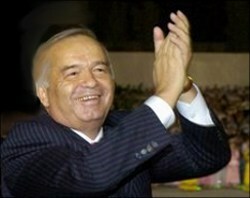 The Orwellian-style Ministry of Truth exists in Uzbekistan as well. Its trace emerged when the abovementioned webpage disappeared, because it read that Uzbek exports decreased by 5.1% in 2012 . The ministry of truth has made a significant and obvious blunder. Such enormous discrepancies, in billions of US dollars, warrant questioning the competence of leaders in the economics departments of the Uzbek government and the adequacy of their decisions. You know, it is understandable when the government’s reports independent observers’ reports or those of the opposition. But where on earth is it seen that a government contradicts its own report with such significant difference in a different report on the same topic?.. These and other “Error 404s” suggest that the Uzbek government is more comfortable with pulling figures from thin air rather than actually working for the economic and social wellbeing of the population. We are always surprised with President Karimov: he can say inflation is irreversibly declining, then he says something like $500 is the amount of average salary in Uzbekistan, and for some reason he is surprised by the fact the Uzbek labor migrants seek jobs in Russia. It is highly probable that the chief economist of Uzbekistan believes the astronomic achievements he reads in such reports and has been completely oblivious of the reality on the ground for the last several years. Apparently, President Karimov not only ignores “foes’ voices” as in the good old Soviet times but also shuns the Internet. Therefore, the Statistics Committee-issued report was not removed from the website because it contradicts the president’s copy, but because they feared to disappoint The World Bank, whose advices and recommendations rely exclusively on the official statistic data. It is difficult to disagree with this renowned expert who emigrated from Uzbekistan, unfortunately. As far as the economists at President Karimov’s court are concerned, they seem to have a different opinion on the matter. After all, they are trying to appease their boss, however clumsily.